The green issues concerning services are mainly to do with materials in terms of their embodied energythe total amount of energy it takes to make a material (or a building). See more on embodied energy, their manufacture and their reusability / recyclability. Also the question of dangerous emfsThe Electromotive force. This is the electrical force developed around wires (such as mains wiring) carrying high voltages. The force dies off rapidly with the distance from the cables. See more in Electrics keeps resurfacing. 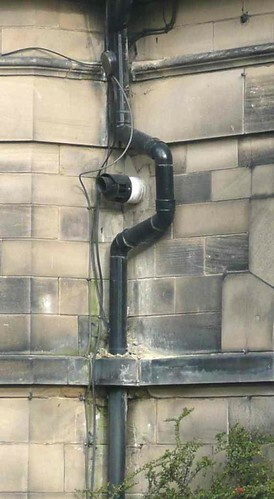 water supply pipes – traditional lead ones are associated with lead poisoning. electric cables are usually insulated with PVC – possible pollution problems from fire as well as manufacture and disposal. The problems with PVC are compounded in the case of insulation on electrical wiring because if the wires overheat and cause the PVC to ignite then hazardous fumes can be given off. The alternative is to use low smoke halogen free (LSHF) cable. I WAS WONDERING IF YOU ARE DOING ANYMORE SCHEMES LIKE THE SELF BUILD PROJECT FINISHED IN BRIGHTON. I HAVE 30 YEARS IN CONSTRUCTION IN ALL PROJECTS FROM NEW BUILD HOUSES,OFFICE BLOCKS, FLATS TO ECO BUILDS AND STONE ROUND HOUSES ETC, THAT IS A PART TO MY WORK HISTORY AT PRESENT TIME. AND I WILL BE MADE HOMELESS IN ONE MONTH TIME. That is true, but I suspect that hazardous vapours could be given off simply at high temperatures, i. e. without actual fire (ignition) with flame. That’s the bad news. Some good news is surely that in the UK there are codes and standards designed to reduce risks: as Wikipedia states “There are a number of specific national practices, habits and traditions associated with electrical wiring in the United Kingdom … (the “Wiring Regulations”) … … ” So there is guidance – most of it regarding the required thickness (area of cross-section in square millimetres)) of the metal part of the wiring (the conductor) needed for the power (Watts) being transmitted through the wiring. Power = Potential difference (expressed in Volts) x current (expressed in amperes i. e. amps. (Sorry if this is obvious – I obviously don’t know who will read this! Some more bad news is that if wiring is covered by thermal (as opposed to just electrical) insulation, then higher temperatures will inevitably be reached: I think that this follows inevitably from the “heating effect of an electric current” which I studied at school(in the previous millennium!). The heat generated by the electric current needs to escape to the external environment if heating is to be avoided. And higher temperatures would tend to occur if one put thermal loft insulation where it covers electrical wiring – such as when placing or adding fibreglass or other insulation in a loft or attic. To avoid this, one could divert the wiring – e.g. by lengthening it so that it was outside the thermal insulation, e. g. by inserting one or more extra sections (with suitable joins). Or divert wiring from being in the roof space to being inside the rooms of the house (I am not sure if this is acceptable). The downside of lengthening is that one would use up more conducting metal (typically copper) and more electrical insulation (typically PVC).